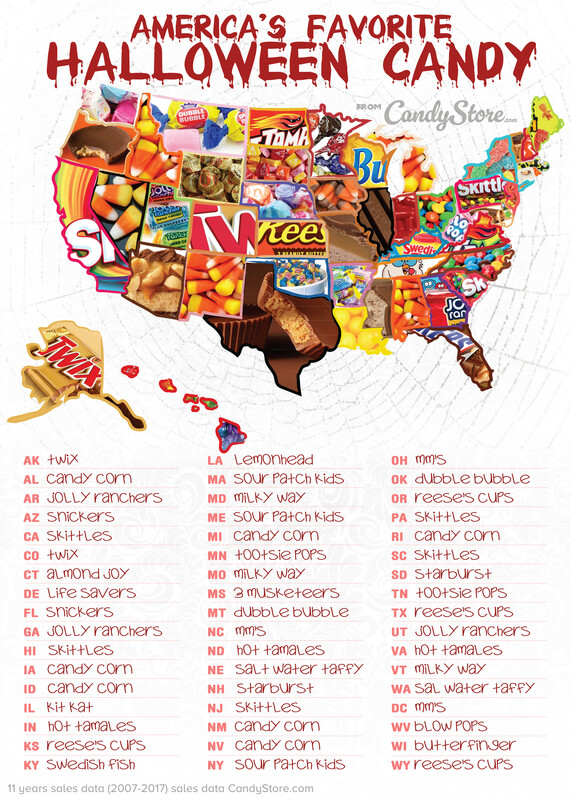 What's the most popular Halloween candy in your state? Check out the fun interactive map below (provided by CandyStore.com). FYI: Best viewed on a computer/laptop and not your iPhone. FloridaThe sun shines strongly here, transforming many an upstanding Florida citizen into the Mr. Hyde of America, Florida Man. And as Florida Man knows all too well, you’re not yourself when you’re hungry. Maybe that’s why Snickers is the new top Halloween candy in Florida. Skittles has been bumped down to #2. Tasting the rainbow has become slightly less of a priority to Floridians, and I frankly applaud their self-awareness because of it. Over 330 tons of Snickers. Skittles came in second place, Reese’s Cups third.